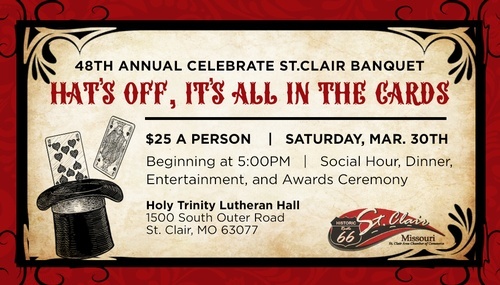 Event Description ​48th Annual Celebrate St. Clair - Hat's Off...It's In The Cards! Hat's Off...It's All In The Cards at the 48th annual awards banquet where many individuals and organizations will be recognized for their 2018 accomplishments. $25 per person...Tickets may be purchased online immediately or in person at the St. Clair License Office and Chamber Office starting February 4th. Event Sponsorship is available...please call the Chamber office at 636-629-1889 for more details or click on attached flyer.